I'm back to working on some bags this week. This is a beauty! Did you do the crochet or is it vintage. I collect the vintage ones and use them as coasters. This is a very sweet bag. I love the use of the crocheted front and those buttons are wonderful. 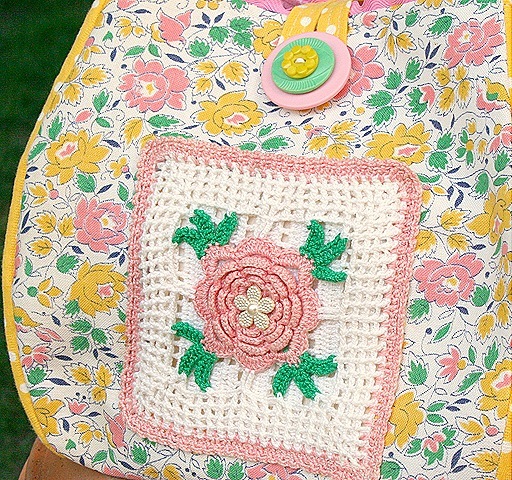 What a great way to feature a great vintage potholder. You are so creative! That is just gorgeous. I was taken aback when I first looked. I need to see what else you have done!!! That is a cute bag. Whimsical and lovely! Happy to see that spring has arrived for you…not here yet. It was 60 degrees in the house this morning.